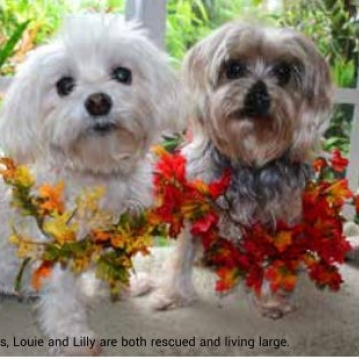 When mom’s yorkie crossed over, she said, “NO more dogs, Louie is going to be an only. I can’t go through that (loss) again”. Louie is a nine-year-old, affable maltese. In her seventies, my mom still works full-time, manages a house and tends to an acre of lushly landscaped property. Louie eats holistic food, gets groomed regularly and is up to date with his vet. He needs a friend for company and to keep active. I started looking for an at least five-year-old female. Through a personal friend posting on social media, we found a medical-special needs morkie. Mom’s canine household is happily abark, again. A seven-year-old maltese was surrendered to me. An adoption application was received by a rescue organization I volunteer with. They thought the couple (husband in his 80s, wife in late 70s) was too old. I agreed to meet them. We went for a home visit. Aidan acted like he owned the place. Turns out the man is a body builder, woman is a race-walker. The fact that they live five minutes away from me was an added bonus. They have told me, numerous times, that they’ve always had dogs - big dogs, and that Aidan is the best dog they’ve ever had. He’s living a blessed life. Dad’s maltese went to the Rainbow Bridge a couple years ago. She was at least 13, and went deaf and blind in her twilight years. Sophie was his world. She got him out, walking, talking to neighbors, and kept him company. He enjoyed caring for her. After all this time, he is ready for a dog again. He is retired and really needs a small companion. He was denied by several rescue organizations. 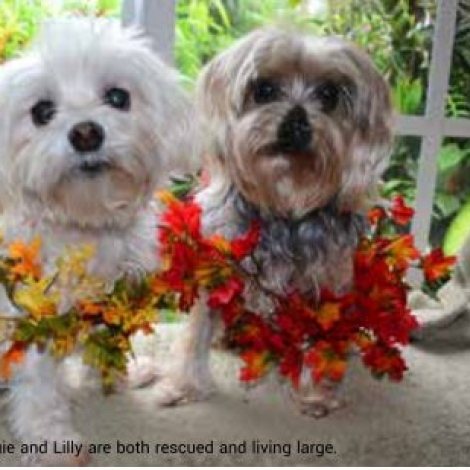 Some rescues have a policy of not adopting to adults under age 25 or over 70. Shouldn’t each prospective home be screened on an individual basis? By being less judgmental and working together more pets can be placed in loving homes. My husband’s family didn’t have pets. Bob always wanted to live in a house (not a condo) and have a dog (be careful what you wish for). Their family liked to travel. My mother-in-law and I didn’t see eye to eye on many things. My love of animals topped the list. “It’s so much work. Too much responsibility!” she would say. “Far far far less headache and heartache than raising children,” I replied. Pets don’t ignore you, complain about what you serve them, or say hurtful things. Always happy to see you, pets don’t hang out with the wrong crowd or make immoral decisions. They never ask for money or to borrow the car. They’re never embarrassed to be seen with us, regardless of our shape, age or hair style. The only time they break your heart is when it’s time to leave us, physically. My widowed mother-in-law (late 80s) was very lonely. A friend had an adult cat they needed to rehome. She raves what a wonderful friend Puff is. He doesn’t allow her to sleep away the day. He demands wet food in the morning, or for her to open the slider, so he can sun on the patio. He listens intently, talks to her, and keeps her blood pressure down. She said, “NOW I see why you love animals so much!” she fell recently. While she is getting physical therapy away in rehab, Puff is giving her a reason to work hard, return home and resume their routine. Senior pets (seven plus years old) for senior citizens is a winning combination. Seniors usually have more time, energy and disposable income to lavish on their companion animals. A senior pet is usually calmer, house-trained, and requires less exercise. One irrefutable precaution when adopting to seniors: There MUST be a documented, agreed upon care-plan in place if/when the adopter is no longer able to care for the pet. Regardless of your age, have a plan for your pets. Discuss your pet’s placement and care with a family member, friend or care giver. Put it in writing. Include vet records and funds designated for their care. Tomorrow is not promised to any of us. Documenting this responsibility and pre-planning for animal family members will give you great peace of mind. Dietary Solutions for PetsModern FamilyEnsure a Fun and Safe Howl-O-Ween for Your Pet Priviledge to be Living in the Time of LebronIs Raw Food Right for My Pet?